Cantor; born in Treuchtlingen, Bavaria, 1813; died in New York city March 4, 1902. He was descended from a family of cantors, traceable in an unbroken line as far back as 1612, every generation having had at least one member devoted to the profession. 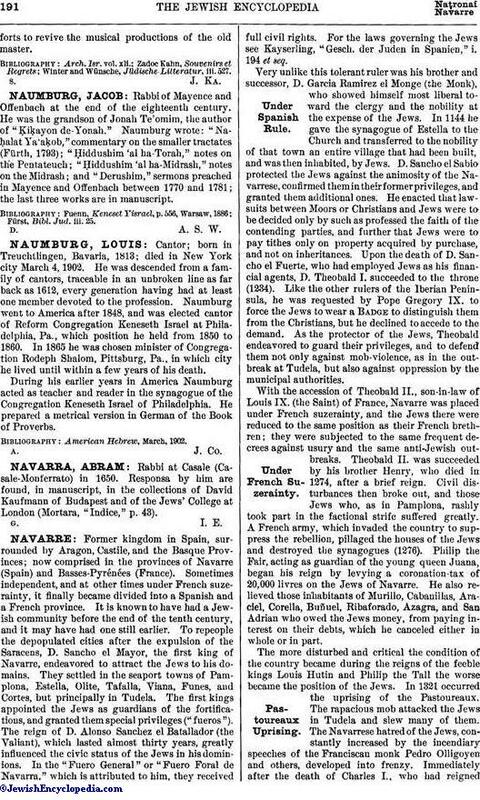 Naumburg went to America after 1848, and was elected cantor of Reform Congregation Keneseth Israel at Philadelphia, Pa., which position he held from 1850 to 1860. In 1865 he was chosen minister of Congregation Rodeph Shalom, Pittsburg, Pa., in which city he lived until within a few years of his death. During his earlier years in America Naumburg acted as teacher and reader in the synagogue of the Congregation Keneseth Israel of Philadelphia. He prepared a metrical version in German of the Book of Proverbs.